Being totally self-sufficient is an idea that occasionally grabs many of us – cutting free from it all, and bending ourselves only to the natural rhythms of the world. A chance to consign the complexities of modern life to the compost heap. Except that this happy dream of ‘starting all over’ stumbles when it comes to the practicalities. Most of us live in apartments in cities, or in the suburbs – and sadly lacking in the acres of good solid land needed to feed, clothe and nurture us. So it’s easy to just dream on. But it doesn’t have to be so black and white. Maybe it’d actually be more helpful to look at the glass as half-full, and to see what we can do, here and now, with the lives and homes we’ve already got. And if we can’t be totally independent and self-sufficient, maybe that’s a good thing. After all, the whole populace can’t just up sticks, to mark out their own piece of rural idyll -there’s not enough of it out there. So perhaps self-sufficient-ish is good place to start. With that in mind, what practical things can the urbanite, or suburbanite, do to make their home a little bit more part of the solution – rather than the problem. Well, for those who are apartment-block bound, the potential does seem a little limiting. However, there is much that can be done to make your lifestyle more ecologically productive, even on the tenth floor. 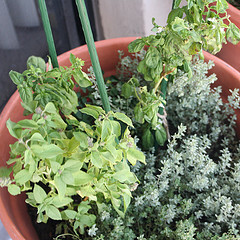 A good place to start is with growing your own vegetables and herbs. If you have a small balcony, then excellent – especially if it has a south facing aspect. There you can grow an abundant range of crops – small summer-fruiting shrubs, salads, root crops and even potatoes. But even if you’re limited to window sill space, there’s plenty that will thrive on as little as 6 hours sunlight a day. Lettuce, tomatoes, endives and peppers will all do well in the warmth of your flat. Herbs are also easy to grow, as well as use – and add a freshness and zest to your cooking repertoire. Don’t forget, also, that urban smallholders can make the most of the resources out there in the green corners of the city, just waiting to be gathered. Edible and useful wild herbs can often be found, even in the densest of urban jungles. Then there are the ornamental fruit trees in city parks. Cherry, crab apple and even citrus fruits can be found in abundance, depending on your locale and clime. These can be eaten fresh, dried and stored, or even made into fabulous home-made wines. For those suburban homeowners with a little more space, the garden opens up a plethora of opportunities for vegetable, salad and fruit growing. But you can also enlist the services of a million little helpers, if you take a time to learn the art of bee-keeping. Bees can flourish in the well-flowered gardens of suburbia, furnishing you with plentiful jars of sticky sweet honey – not to mention candle wax. Additionally, there are many animals suitable for rearing in small places, who can provide eggs, meat and even milk. Chickens, duck and turkeys can thrive on quite little patches of land, and will produce more than enough eggs and meat for the table. They also dual as scrap eaters and producers of an excellent fertilizer – their manure is a great nutrient boost for your compost heap. And for those with a little more space, and time, to commit – miniature cows can be quite feasibly kept on 2 acres of so of grazing. As can be seen, the range of options open to the self-sufficient-ish is wide and varied. By investing some time and space into providing for your own food, you’ll be taking off some of the excessive burden, laid on the planet by industrial farming and retailing. You’ll also be skilling yourself up for a future where a measure of food-independence will be important. Getting out there, and immersing yourself in the natural world can also let you live your dream a little. And maybe a micro-small holding will only be the beginning. We are in the suburbs and are working slowly to try to get to a better place of self-sufficiency and subsidizing that with a CSA from a wonderful local farm. We are nowhere near where I would like us to be (for many reasons), but I believe in small steps.